This is a timeline of Important dates and events for before, during and after the American Revolution. The Revolutionary War, was one of the most significant events in American history. Without it, the United States of America may not have come into existence. Read on and learn why it happened, and learn about key events of the revolution. 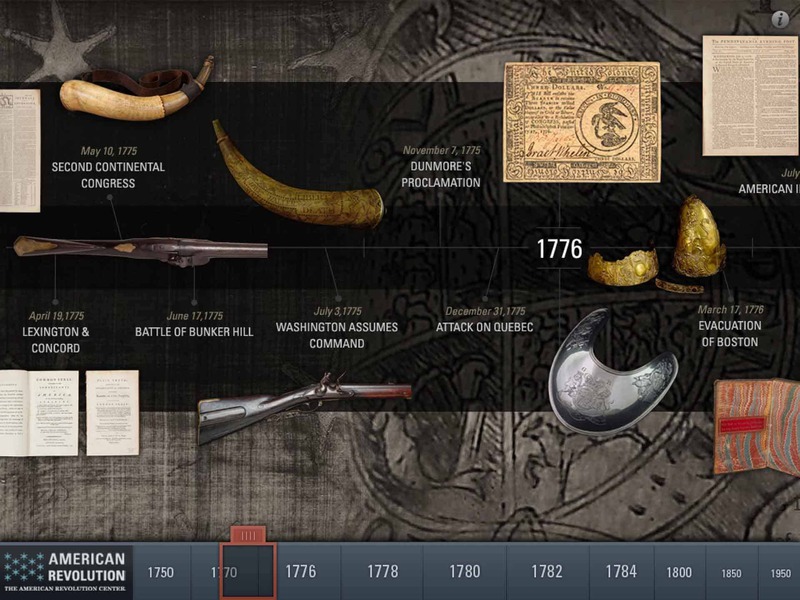 This timeline chronologically illuminates the cause and effect timeline of the Revolutionary War. Each action promoted a reaction; clearly identified the parties to the conflict, and set the stage for the responses that drove the Americans to war. Here are some key events and dates for the American Revolution and the war for independence. The Revolutionary War was between the Kingdom of Great Britain and the Thirteen American colonies. The colonists did not like the way the British were treating them, especially when it came to taxes. Eventually small arguments turned into larger fights and the colonists decided to fight for their own country, independent of Britain. February 10, 1763 - The Treaty of Paris ends the Seven Years War (French and Indian War). France surrenders all of its North American possessions east of the Mississippi to Britain. This ends a source of insecurity for the British colonists along the Atlantic Coast. The costs of the war and maintaining an army will lead the British government to impose new taxes on its colonists, with world-shaking results. April 5, 1763 - The Sugar Act, also known as the American Revenue Act or the American Duties Act, was a revenue-raising act passed by the Parliament of Great Britain on April 5, 1763. The preamble to the act stated: "it is expedient that new provisions and regulations should be established for improving the revenue of this Kingdom ... and ... it is just and necessary that a revenue should be raised ... for defraying the expenses of defending, protecting, and securing the same." The earlier Molasses Act of 1733, which had imposed a tax of six pence per gallon of molasses, had never been effectively collected due to colonial evasion. By reducing the rate by half and increasing measures to enforce the tax, the British hoped that the tax would actually be collected. These incidents increased the colonists' concerns about the intent of the British Parliament and helped the growing movement that became the American Revolution. May 7, 1763 - Pontiac leads Ottawa and other Indians in an attack on the fort at Detroit. Failing to take the fort, the Indians begin to lay siege to it. The raid marks the beginning of Pontiac's Rebellion. It was also known as Pontiac's War or, in England, as Pontiac's Conspiracy. September 1, 1763 - The Currency Act is passed by Parliament, prohibiting the colonies from issuing paper money. October 7, 1763 - Wary of the cost of defending the colonies, George III prohibited all settlement west of the Appalachian mountains without guarantees of security from local Native American nations. The intervention in colonial affairs offended the thirteen colonies' claim to the exclusive right to govern lands to their west. April 5, 1764 - Parliament passed a modified version of the Sugar and Molasses Act (1733), which was about to expire. Under the Molasses Act colonial merchants had been required to pay a tax of six pence per gallon on the importation of foreign molasses. 1765 - In 1765 the Sons of Liberty was formed. The Sons of Liberty was an an organization (a secret society) formed by American Patriots who opposed British measures against the colonists, and agitated for resistance. The Sons of Liberty was initially formed to protest against the Stamp Act but the patriots continued to speak, write and demonstrate against British measures in Colonial America until the Declaration of Independence in 1776. March 22, 1765 - The Stamp Act of 1765 was an Act of the Parliament of Great Britain that imposed a direct tax on the colonies of British America and required that many printed materials in the colonies be produced on stamped paper produced in London, carrying an embossed revenue stamp. Printed materials included legal documents, magazines, playing cards, newspapers, and many other types of paper used throughout the colonies. Like previous taxes, the stamp tax had to be paid in valid British currency, not in colonial paper money. The purpose of the tax was to help pay for troops stationed in North America after the British victory in the Seven Years' War and its North American theater of the French and Indian War. The Americans said that there was no military need for the soldiers because there were no foreign enemies on the continent, and the Americans had always protected themselves against Indians. They suggested that it was actually a matter of British patronage to surplus British officers and career soldiers who should be paid by London. March 24, 1765 - The Quartering Act is a name given to a minimum of two Acts of British Parliament in the local governments of the American colonies to provide the British soldiers with any needed accommodations and housing. It also required colonists to provide food for any British soldiers in the area. Each of the Quartering Acts was an amendment to the Mutiny Act and required annual renewal by Parliament. They were originally intended as a response to issues that arose during the French and Indian War and soon became a source of tension between the inhabitants of the Thirteen Colonies and the government in London, England. These tensions would later fuel the fire that led to the American Revolution. October 7, 1765 - Representatives from nine of the thirteen colonies declare the Stamp Act unconstitutional as it was a tax levied without their consent. March 18, 1766 - The American Colonies Act 1766, commonly known as the Declaratory Act, was an Act of the Parliament of Great Britain, which accompanied the repeal of the Stamp Act 1765 and the changing and lessening of the Sugar Act. Parliament repealed the Stamp Act because boycotts were hurting British trade and used the declaration to justify the repeal and save face. The declaration stated that the Parliament's authority was the same in America as in Britain and asserted Parliament's authority to pass laws that were binding on the American colonies. July 25, 1766 - Failing to persuade tribes in the West to join his rebellion, and lacking the hoped-for support from the French, Pontiac finally signed a treaty with the British. In 1769, he was murdered by a Peoria Indian while visiting Illinois. June 29, 1767 - The Townshend Acts were a series of British acts passed beginning in 1767 and relating to the British American colonies in North America. The acts are named after Charles Townshend, the Chancellor of the Exchequer, who proposed the program. Historians vary slightly as to which acts they include under the heading "Townshend Acts", but five acts are often mentioned: The Revenue Act of 1767, the Indemnity Act (1767), the New York Restraining Act (1767), the Commissioners of Customs Act (1767), and the Vice Admiralty Court Act (1767). The purpose of the Townshend Acts was to raise revenue in the colonies to pay the salaries of governors and judges so that they would remain loyal to Great Britain, to create a more effective means of enforcing compliance with trade regulations, to punish the province of New York for failing to comply with the 1765 Quartering Act, and to establish the precedent that the British Parliament had the right to tax the colonies. Oct 1768 - British troops land in Boston to enforce the Townshend duties (taxes on paint, paper, tea, etc., passed in June 1767) and clamp down on local radicals. The troops' presence doesn't sit well with locals and leads to street fights. One clash between soldiers and a mob in March 1770 will leave five dead. Radicals will call it the Boston Massacre, while the British will call it the incident on King Street. March 5, 1770 - Angered by the presence of troops and Britain's colonial policy, a crowd began harassing a group of soldiers guarding the customs house; a soldier was knocked down by a snowball and discharged his musket, sparking a volley into the crowd which kills five civilians. 1772 - In the Spring 1772, Committees of Correspondence are established throughout the colonies to coordinate American response to British colonial policy. This represents an important move toward cooperation, mutual action, and the development of a national identity among Americans. June 10, 1772 - The revenue schooner Gaspee ran aground near Providence, Rhode Island and was burnt by locals angered by the enforcement of trade legislation. May 10, 1773 - The Tea Act 1773 was an Act of the Parliament of Great Britain. The principal objective was to reduce the massive amount of tea held by the financially troubled British East India Company in its London warehouses and to help the financially struggling company survive. A related objective was to undercut the price of illegal tea, smuggled into Britain's North American colonies. This was supposed to convince the colonists to purchase Company tea on which the Townshend duties were paid, thus implicitly agreeing to accept Parliament's right of taxation. The Act granted the Company the right to directly ship its tea to North America and the right to the duty-free export of tea from Britain, although the tax imposed by the Townshend Acts and collected in the colonies remained in force. It received the royal assent on May 10, 1773. Colonists in the Thirteen Colonies recognized the implications of the Act's provisions, and a coalition of merchants, smugglers, and artisans similar to that which had opposed the Stamp Act 1765 mobilized opposition to delivery and distribution of the tea. The company's authorized consignees were harassed, and in many colonies successful efforts were made to prevent the tea from being landed. In Boston, this resistance culminated in the Boston Tea Party on December 16, 1773, when colonists (some disguised as Native Americans) boarded tea ships anchored in the harbor and dumped their tea cargo overboard. Parliamentary reaction to this event included passage of the Coercive Acts, designed to punish Massachusetts for its resistance, and the appointment of General Thomas Gage as royal governor of Massachusetts. These actions further raised tensions that led to the eruption of the American War of Independence in April 1775. July 1773 - In these letters, Hutchinson, the Massachusetts governor, advocated a 'great restraint of natural liberty', convincing many colonists of a planned British clamp-down on their freedoms. December 16, 1773 - Angered by the Tea Acts, American patriots disguised as Mohawk Indians dump £9,000 of East India Company tea into the Boston harbor. March to June 1774 - From to March to June, 1774, The British Parliament passes the Coercive Acts, often called the Intolerable Acts in America. The Intolerable Acts were the American Patriots' term for a series of punitive laws passed by the British Parliament in 1774 after the Boston Tea Party. They were meant to punish the Massachusetts colonists for their defiance of throwing a large tea shipment into Boston Harbor in reaction to changes in taxation by the British to the detriment of Colonial goods. In Great Britain, these laws were referred to as the Coercive Acts. The acts took away Massachusetts' self-government and historic rights, triggering outrage and resistance in the Thirteen Colonies. They were key developments in the outbreak of the American Revolution in 1775. Four of the acts were issued in direct response to the Boston Tea Party of December 1773; the British Parliament hoped these punitive measures would, by making an example of Massachusetts, reverse the trend of colonial resistance to parliamentary authority that had begun with the 1764 Sugar Act. A fifth act, the Quebec Act, enlarged the boundaries of what was then the Province of Quebec and instituted reforms generally favorable to the French Catholic inhabitants of the region; although unrelated to the other four Acts, it was passed in the same legislative session and seen by the colonists as one of the Intolerable Acts. The Patriots viewed the acts as an arbitrary violation of the rights of Massachusetts, and in September 1774, they organized the First Continental Congress to coordinate a protest. September 1774 - Colonial delegates meet to organise opposition to the Intolerable Acts. March 23, 1775 - Patrick Henry delivered his famous speech in St. John's Church in Richmond, Virginia. Those who heard the speech were motivated to take up the cry of "Give Me Liberty or Give Me Death!". The famous speech helps to convince the Virginia House of Burgesses to pass a resolution delivering the Virginia troops to the Revolutionary War. May 10, 1775 - The members of the Second Continental Congress met at the State House in Philadelphia. There were several new delegates including: John Hancock from Massachusetts, Thomas Jefferson of Virginia, and Benjamin Franklin from Pennsylvania. The Second Continental Congress meeting started with the battle of Lexington and Concord fresh in their memories. The New England militia were still encamped outside of Boston trying to drive the British out of Boston. The Second Continental Congress established the militia as the Continental Army to represent the thirteen states. They also elected George Washington as Commander in Chief of the Continental Army. The Massachusetts Provincial Congress, aware of the necessity of enlisting the support of all of the colonies in the struggle against the British, appealed to the Continental Congress to adopt the New England army. Congress appointed a committee to draft regulations for a new Continental Army. Congress voted to adopt the measure, marking the official creation of the United States Army. Also, this date marks the creation of the Infantry. The same day, Congress voted to raise 10 companies of riflemen. These were the first soldiers to be enlisted directly in the Continental service in Pennsylvania, maryland, and Virginia, to march north to join the current force besieging Boston. Issued $2 million bills of credit to fund the army. The First Continental Congress adopted the "Olive Branch Petition". This petition stated that, while reiterating the grievances of the colonists, the Congress professed their attachments to the king of England and a desire for a reconciliation and avoidance of any further hostile actions. King George III refused to receive the petition, and instead, he issued his own proclamation on August 23. This proclamation declared that the colonies to be in a state of rebellion. Congress authorizes establishment of a Naval Committee. The beginning of The U.S. Navy. During November Congress creates The American Navy. The British governor of Virginia, Lord Dunmore, issues a proclamation offering freedom to any slaves of rebellious Americans who are able to enter British lines. Throughout the course of the war, tens of thousands of African Americans will seek their freedom by supporting the British. A smaller number will fight on the patriot (pro-independence) side, despite policies that discourage their enlistment. The United States Marine Corps is founded. the Continental Congress authorized the establishment of the American Navy. Although the Navy was to play only a minor role in the war, the success of American privateers in interrupting British trade was an important factor aiding the patriot cause. Thomas Paine's Common Sense published anonymously in Philadelphia. Marines execute their first military expedition. This is The first time The American Flag would fly over a foreign country. France provides covert aid to the Americans. before 1:00 A.M. near Whitehall Slip, a fire broke out in a wooden house. With the help of a strong wind, the fire quickly spread north. Around 2:00 A.M., a change in wind direction confined the fire to an area between Broadway Street and the Hudson River. In the end, a total of 493 homes were destroyed before the fire could be put out. The British accused the Americans of starting the fire. British troops had planned on using the houses in the area as billeting and stated that The Americans burned the city to prevent this from happening. The American Flag is officially mandated by Congress. On July 27, at Fort Edwards, New York, Jenny McRae and Mrs. McNeil were captured by Maj. Gen. John Burgoyne's Indian allies, which were travelling ahead of the British army. Jenny, or Jane, was a Tory girl who had lived with her brother on the Hudson River, between Saratoga and Fort Edward. She was engaged to Lt. David Jones, a Tory in the service of Burgoyne's army. She had went to join her fiance at Fort Edwards when she was captured. The Indians started back to Fort Ann, where Burgoyne was headquartered. They arrived with Mcneil and the scalp of Jenny. Jones identified the scalp as belonging to McRae. The killer was identified but was not punished by Burgoyne. he did not want to alienate his allies. The incident was used a propaganda for the local citizens. Local outrage over the killing, even though she was a Tory, stirred the patriot cause and called to the colors the farmers of Bennington. This would prove the undoing of Burgoyne's grand strategy. John Paul Jones receives an old French Vessel. It is renamed The Bonhomme Richard. After the Battle of Saratoga, Congress decided to seek French support in the war. They sent Benjamin Franklin, who could speak French, to meet with King Louis XVI and the French foreign minister. France wanted to get revenge on Britain for the defeat in the French and Indian War. They also wanted to ensure that Britain and America don't resolve their differences. In February 1778, France and America signed a treaty which put France at war with Britain. This treaty was the first document to officially recognize America as an independent state. The Colony of Virginia annexes all territory captured by George Rodgers Clark, naming it Illinois. France induces Spain to declare war on the British by promising to assist the Spanish in recovering Gibraltar and Florida after the British reject the Spanish ultimatum presented to them on April 3. Spain refuses to recognize or enter into an alliance with the United States. However, the Spanish commence joint naval operation with the French and this assists the American cause. On New Year's Day, 100 soldiers from Massachusetts mutiny and attempt to return home at the expiration of their enlistment, or in some cases, shortly prior. Some are punished although the majority is pardoned. Maj. Gen. Benedict Arnold was faced with financial ruin, uncertain of future promotion, and disgusted with congressional politics. He decided to seek fame and fortune in the service of the British. With cool calculation, he initiated correspondence with Gen. Sir Henry Clinton, the local British commander. Arnold promised to deliver West Point and its 3,000 Patriot defenders for 20,000 sterling. He hoped that this act would spark the collapse of the American cause. Persuading Gen. George Washington to appoint him commander of West Point, Arnold moved in September 1780 to execute his plan. On September 21, Maj. John Andre, Arnold's co-conspirator, came ashore near the town of Havestraw. Andre arrived aboard the HMS Vulture. There, he met Arnold to finalize the agreement. Unfortunately for both of them, the Vulture came under American fire and headed away. This unfortunately left Andre stranded. He reluctantly put on some civilian clothes and headed down the Hudson River with a safe conduct pass from Arnold. Andre was eventually captured near the town of Tarrytown. He was soon turned over to the commander at North Castle. Found on Andre was the incriminating papers that Arnold had given him. When Arnold was notified that a British officer had been captured, he fled by boat to the HMS Vulture. On September 25, Benedict Arnold escapes from America. Arnold received 6,000 Sterling from the British government and an appointment as a Brigadier General in The British Army. Winter inactivity combined with grievances concerning enlistment terms, pay, and food, among other things, culminates in mutiny in the Continental camp located near Princeton, New Jersey. Little is known about how the mutiny is organized. The two leaders are a William Bozar and John Williams. Only two individuals are recorded as having died in the mutiny. The mutineers intend to confront the Continental Congress in Philadelphia. General "Mad" Anthony Wayne manages to defuse the situation on which the British hope to capitalize. However, almost half the soldiers involved in the mutiny leave the army. While in winter quarters at Pompton, New Jersey, these soldiers have the same basic complaints as their compatriots of the Pennsylvania Line. Washington sends a 600-man force commanded by Robert Howe to suppress the mutiny and enforce unconditional surrender. Howe surrounds the Pompton encampment at dawn on the 27th. Sergeant David Gilmore and John Tuttle are tried and immediately executed on the spot by other prominent mutineers serving as an example to the other soldiers. The Continental Congress ratifies the Articles of Confederation initially proposed by Richard Henry Lee on June 7, 1776. After a long delay these articles are sent to the individual states for ratification on November 15, 1777. Bickering over land claims between Virginia and Maryland holds up ratification until March 1, 1781. The nation is guided by the Articles of Confederation until the ratification of the Constitution on November 21, 1788. In Charleston, South Carolina Patriot militia officer Isaac Hayne is executed by the British. Prior to the war he is a horse breeder and owns an iron works. Hayne is captured at Charleston and paroled, but later the British attempt to have him join the Loyalist militia. Hayne considers the terms of his parole invalidated by this action and once again joins the Patriots. He is again captured but this time hanged as a spy without a trial. The evacuation of loyalists begins. Largely unwelcome in the new United States, about 100,000 Americans who remained loyal to the crown find new lives in Britain, Canada, and British colonies in the West Indies. Br. General Sir Guy Carleton replaces General Clinton. He is to cease all military action with America. America and Britain signed preliminary peace articles in Paris, ending the Revolutionary War. Revolutionary War is over in SC. Great Britian, France, and Spain signed the preliminary Articles of Peace. In doing so, this established a military armistice both among themselves and between England and America. This day marks The end of The war as England officially declares an end to all hostilities with America. The U.S.S. Alliance, commanded by Captain John Barry and a French Vessel, The Duc de Luzon engage two British Sloops in what is The final Naval Battle of The war. Thirty-three of The remaining 41 Marines are mustered out of The service. Six months later, Lt. Elwood becomes The final Marine to muster out. The Marines are totally disbanded after seven years of fighting The British. The Treaty of Paris ratifies the independence of the 13 North American states. Canada remains a British province, beginning its separate development as a U.S. neighbor. Another war with England (1812 - 1815) will be necessary to truly secure the American nation. Congress directs General Washington to decrease The Army. The Army is disbanded except for 600 men who will guard West Point. Only one Regiment and 1 Artillery Battalion remain in The American Army. Congress ordered Gen. George Washington to furlough all of the Continental troops that had enlisted for the duration of the war. On June 11, Congress authorized the Secratary of War to furlough the troops of the middle states that were not already released. On November 3, Congress ordered the discharge of all of the furloughed troops. British force completed their troop evacuation of New York City. Also evacuating the city earlier was about 7,000 Loyalists, heading for Maritime Provinces, Canada, and Great Britian. Withdrawal of the last British troops from Staten Island and Long Island. This officially ended the British occupation of the Atlantic coast of the United States. George Washington officially resigns his commission and retires to private life. The Treaty of Paris is ratified by the Congress. Congress authorizes The establishment of a new Regiment which is to be The beginning of the new Regular Army. The Treaty of Fort Stanwix imposes a peace on those members of the Iroquois Confederacy that sided with the British in the Revolution. The war's aftermath will prove devastating to Native Americans. With no European allies to rely upon, Indian tribes will be under increasing pressure from settlers moving west out of the original 13 states. The U.S.S. Alliance, The solitary remaining Vessel in The American Navy is sold for scrap. Within one month, Algiers begins hostilities against The U.S., a nation without any Naval Ships. A convention of states in Philadelphia proposes the Constitution to replace the much looser central government operating under the Articles of Confederation (adopted in 1777). With amendments, the Constitution remains the framework of government in the U.S.
Georgia, Connecticut, Massachusetts, Maryland, South Carolina, New Hampshire, Virginia and New York ratify the constitution. North Carolina reconquers Franklin, which ceases to exist. Rhode Island and Providence Plantations becomes the 13th state to ratify the Constitution, with a vote of 34–32. Ratification of the United States Bill of Rights.